At the start of the last parliament, David Cameron claimed that the coalition would be ‘the greenest government ever’. Over the course of the parliament, this claim was frequently tested by environmental campaigners and his political opposition, particularly concerning the Government’s attitude to fracking and ‘green taxes’, and the handling of the controversial forestry sell-off policy. Five years on, as we reflect on the term of the coalition, many environmentalists will feel lots more could (and probably should) have been done, but will also recognise the steps made domestically and internationally on, for instance, carbon and emissions targets. Where ‘green’ progress has been made, in many cases this can be credited to the Liberal Democrat influence in the coalition (such as Chris Huhne’s and Ed Davey’s successes at DECC). So, with a majority Conservative government in power for the first time in almost 20 years, we must inevitably now wonder – how will the environment fare? Last month we summarised the main manifesto pledges of each party on the environment. At the time, most polls predicted a hung parliament, so we expected there would be some negotiation regarding the legislative programme following the election. However, this unexpected result now means that David Cameron has pledged to implement the entire Conservative manifesto. 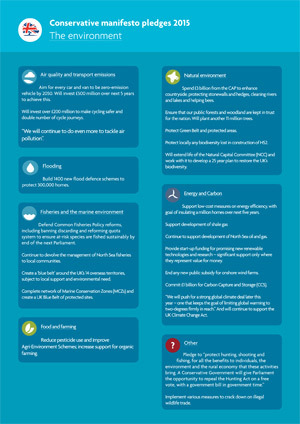 To see what this might mean for the environment, we have produced another factsheet, summarising the relevant pledges, which can be downloaded here (pdf). In most respects, these pledges do not represent major gains for the environmental agenda, although there are some points to encourage environmental scientists and campaigners. On the whole however, environmental issues have been given a disappointingly low profile in both the election campaign and the first Queen’s speech presented by the Government. Some of the main issues arising are discussed below. A manifesto pledge, reiterated in the Queen’s speech, to push for a strong climate change deal later this year in Paris is a positive step. Many environmentalists have also been encouraged by the appointment of Amber Rudd as Energy and Climate Change secretary at DECC. Rudd is recognised by politicians on both benches to hold progressive environmental views within the Conservative party, and is likely to push for strong targets. However, the Government’s (and Rudd’s) strong support for fracking, as well as a promise to end public subsidy for onshore wind farms has provoked much criticism and concern. The potential of a ‘Brexit’ from the European Union is a major cause for concern in the environmental community, where the importance of EU Directives on nature conservation, pollution and a range of other environmental issues for the protection of the UK environment is recognised. The Conservative manifesto included a pledge to allow parliament a free vote on whether to repeal the Hunting Act. This has provoked severe criticism from animal rights campaigners and some environmental groups. As yet it is unclear whether the science budget will continue to be ring-fenced, as it was in the last parliament. It has also been announced that the new Minister for Science, Jo Johnson, will not sit at cabinet. We hope that this does not represent a de-valuing of science, which is essential for promoting both economic prosperity and sustainability into the future. With further cuts planned across all departments it is also a concern that research funded through these budgets (such as at Kew Gardens) could be further damaged. The Conservative manifesto included few new announcements on the natural environment. It is encouraging to see that the Natural Capital Committee will continue to receive support, and that there is a plan to complete the UK’s network of Marine Conservation Zones. However, the lack of further attention in this area is disappointing. In terms of ministerial appointments, Liz Truss will remain as Secretary at Defra. We will have to wait until the Government publishes its first budget to understand the true impact of their proposed programme on the environment, but early indications suggest that these issues are not considered a high priority at present. Government attention to the environment is currently framed firmly in terms of energy and climate change, with other issues largely sidelined. Nevertheless, some ministerial appointments are progressive and encouraging, and we must hope that these individuals can negotiate a strong deal for the environment over the next five years: years which it is increasingly recognised are going to be vital in meeting the serious long term environmental challenges we currently face.